Welcome to the London Borough of Lewisham War Memorial Wiki. 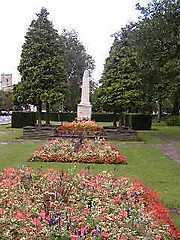 This wiki was launched in November 2008 and it lists the memorials in the current London Borough of Lewisham area, which includes the old Metropolitan Boroughs of Lewisham and Deptford. The initial information was collected by Paul Dyer, a regional volunteer with the UK National Inventory of War Memorials, who generously donated a copy of his research. Thanks to our former volunteers Ann O'Brien and the late Andy Pepper for their hard work this project is a comprehensive resource. For more information on this project click here. This is an ongoing project, which aims eventually to include all the war memorials in the borough, with descriptions, pictures, locations (marked on a map), inscriptions, names recorded, biographies, newscuttings, and histories. We need your help to complete this project. Do you know of any memorials not yet included? As we do not hold any Service or Regimental records here, we also want to record details of the people commemorated. Do you have information about someone whose name appears on a memorial in the borough? An example of the type of personal details we would like to add to this site, and collect for the archives, can be seen at Albert Baker, Humphries, William V A*, Humphries, William Henry James* and Tappenden, Alfred Bernard*. And Henry James Drew material provided by John Bennett his Great Great Nephew, 2017. * Material provided by Alan Humphries January & September 2009. Also there is a site for people to add information about local Lewisham people who died during the First World War. This is intended for anyone to add the information they have but also to help those who have found that their relative or person of interest was a Lewisham person, but their name is not on a local Memorial. or at any Lewisham Borough Library and ask for it to be sent to the Local History and Archives Centre at Lewisham Library. A new Project has been launched In Memoriam 2014 - the War Memorials Trust and the SmartWater Foundation have joined together to provide greater protection for war memorials in the United Kingdom. In addition to locating and photographing memorials, this project will provide SmartWater, a forensic liquid, free of charge to vulnerable and at risk war memorials.